October’s Book Club Choice is Brooklyn by Colm Toibin. I specifically chose this book for two reasons. Firstly, the film version starring Saoirse Ronan is out on 6th November, and secondly, someone recently reminded me what a fantastic novel it is, and I wanted to read it before the film came out. Described by the New Statesman as ‘tremendously moving and powerful,’ this is a book not to be missed. The story centres around Eilis Lacey, who moves to Brooklyn from Ireland to find work. Desperately homesick and miserable, she struggles to fit in. Then one night at a dance, she meets someone and everything changes. But when tragic news calls her back to Ireland, she finds herself facing a terrible choice: between love and happiness in the land where she belongs and the promises she must keep on the far side of the ocean. 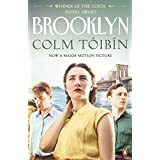 Brooklyn is considered one of Toibin’s finest works and is a must read! I can’t wait to hear your views. Read it BEFORE you see the film! So here’s your link to get you started and I hope you enjoy it. I will let you know as soon as I have finished it! The prose is absolutely stunning and I am loving the story so far. I see what you meant about the description of sea sickness (yuck!) so well described. Don’t forget to check out my review in a couple of weeks when I have finished. Thanks for posting. I loved this book. Do you think she made the right choice in the end?